At least 1,600 people demonstrated on Sunday for abortion to be completely decriminalised in Belgium and recognised as a fundamental human right. The protest in Brussels was called as the federal parliament prepares to debate a bill tabled by the majority that would remove abortion from the Belgian penal code. 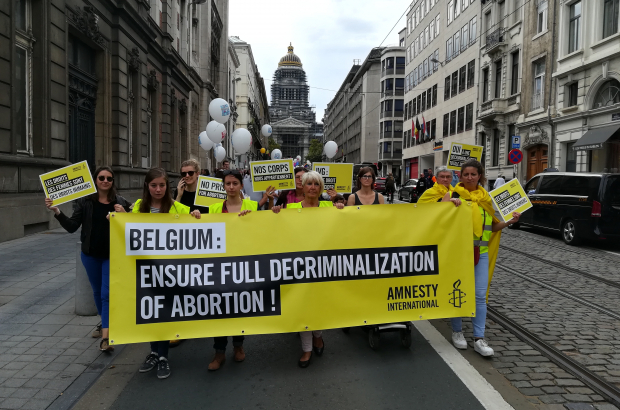 Although abortion within 12 weeks of conception has been allowed in Belgium since 1990, it remains a criminal offence to terminate a pregnancy outside the restrictions imposed by the state. Even if abortion is removed from the criminal code, women would still have to wait during a six-day reflection period before going ahead, except in the event of a medical emergency. Beyond 12 weeks, a pregnancy could still only be interrupted if the health of the mother is at stake or if it is proven that the foetus has an incurable disease. Campaigners say the proposed changes do not go far enough. "This bill is presented as a decriminalisation but does not change anything at all," one of the march organisers said. "We demand an extension of the period during which an abortion is allowed and, especially, a real decriminalisation. In France and Luxembourg, abortion is already a right. It should be possible for us too. "We demand that pregnant women be able to decide freely whether to continue their pregnancy or not. The law must recognise the right of every woman to decide for herself whether or not she wants to have children, when to have children and with whom." Several demonstators dressed up as characters from The Handmaid's Tale, the Margaret Atwood novel turned TV drama in which a totalitarian society forces fertile women to have children.